July 19th 2006 - After more than a decade of using energy medicine in the healing of physical, emotional, and spiritual situations, particularly in the teaching of Quantum-Touch in particular since September, 2004, I thought that I had a lot of knowledge about this marvelous healing model. I had witnessed bones moving into alignment, felt laboured breathing vanish after a few short moments of running energy, observed swelling reduced and the pain taken away in painful joints, felt acid reflux response heal and the accompanying hiatus hernia melt away. I had also witnessed old injuries where broken bones and surgeries from years before were finally healed after a few moments of Quantum-Touch therapy. I thought I had seen it all, and then in the spring of 2005 while teaching one particular class, the students became very intrigued about the water energizing exercise we do on the Sunday. Most people can tell the difference in taste and texture of the tap water following the energizing exercise, however, this group spoke of the water as having been purified. Always one to insist on evidence before I will make statements of fact, I cautioned the class that we did not know that the water had been purified, only that it had been changed and that we could taste and feel the difference. One student spoke of having the water tested by a laboratory to determine whether or not it had been changed in a manner that would reduce bacteria and thus created a more purified product. With that spark began the process whereby a small group of us went to Mooney’s Bay in July to do some water work. 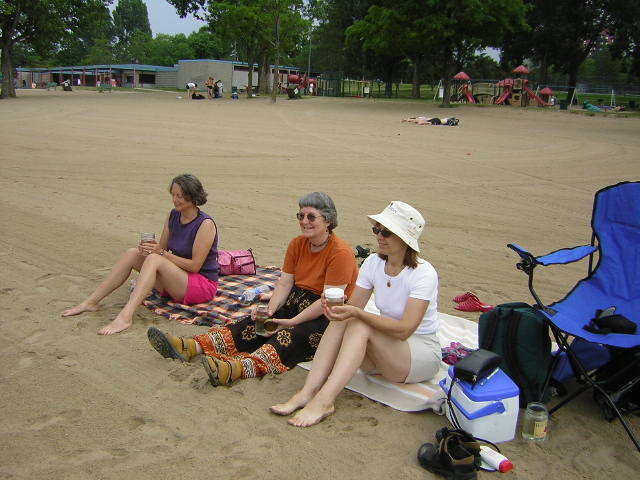 On Wednesday, July 13th at 10:00 a.m. four of us gathered at Mooney’s Bay beach for 1-1/2 hours to run energy into the beach water to determining if this process changed the bacteria counts of the water. Not being a scientist, I developed my own simple idea for doing this work, and I had our little group run energy into a cupful of water every 6 minutes. We would walk into the water, fill our glass jars with about a cupful of water and then sit and run energy for at least 4 minutes and then we poured the water back into the river and took another cupful. I estimate that the four of us working for 90 minutes, energizing one cupful of water every 6 minutes, meant that we would had energized 60 cupfuls of water over the period. I had taken a sample of the beach water before we began our work, and I took another sample after we had finished. These sample containers had been obtained from an environmental laboratory and were handled with utmost care. The tests were to measure the difference in the e-coli and coliform counts both before and after the energy work. I delivered the samples to the laboratory following our work and waited rather anxiously for the results. Sometime during the process I wondered outloud if we were possibly only energizing the bacteria and that they would become much healthier and stronger. The results from the lab came back only on Monday, and by this time I had really put aside my anticipation, as I felt that the results would probably not be spectacular. In fact, I had almost convinced myself that there would probably be no difference at all. When I did receive the report, I was beside myself with joy and amazement at the results. E. Coli reduction: 60.9%, Coliform reduction: 83.6% and the Background counts reduction: 80.2%.